United to miss key duo for kick-off? 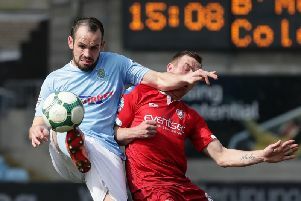 Ballymena United manager Glenn Ferguson is sweating on the availability of two of his key players for the start of the new season. Defender Johnny Taylor could face a suspension after being sent off in Saturday’s 2-2 pre-season friendly draw at Ballyclare Comrades. Taylor and an opponent were dismissed during a flare-up late on in the Dixon Park encounter, where Matthew Tipton and David Cushley scored United’s goals. “We spoke to the referee afterwards to see if some common sense could be applied to the situation but it seems as though he will include it in his report and Johnny could be looking at a suspension, which is something we could have done without,” said Ferguson. Times Sport understands that Taylor will sit out tonight’s (Tuesday) friendly at Harland & Wolff Welders (7pm) by way of an automatic suspension, while any further sanctions will be considered by the IFA’s Disciplinary Committee. Another headache for the manager is the fitness of skipper Allan Jenkins, who had to limp off with an ankle injury. “Allan fell awakwardly on his ankle and then an opponent landed on top of him. Ferguson also re-iterated his intention to keep David Cushley at the Showgrounds, amid speculation linking Linfield with an improved cash bid for the winger. “I’m adamant I want to keep Cush and he has told me he’s happy at Ballymena. “He’s a matchwinner and those type of players are hard to replace, even if you had the money. “There is the offer of a new contract on the table for him,” added Ferguson. After tonight’s friendly at the Welders, United conclude their pre-season campaign this Saturday with a trip to Larne (3pm).